Interview in BLUEGRASS TODAY. “The book was written by John Strand, with music composed by Bob Banghart and Georgia Stitt. We had a chance to speak with Bob and Georgia this week to get some insight into how the music was put together, and they both reported being moved by the story, and the music they wrote to support it.” Read more HERE. When Mary-Mitchell Campbell says, “Hey, would you be willing…. ?” I answer yes. Truly, it doesn’t matter what it is. But in this case, what she’s doing is some of the most inspiring philanthropy I’ve ever witnessed, year after year, seemingly tirelessly, on top of a Broadway schedule that puts the rest of us to shame. Help me celebrate, the organization my dear friend created. 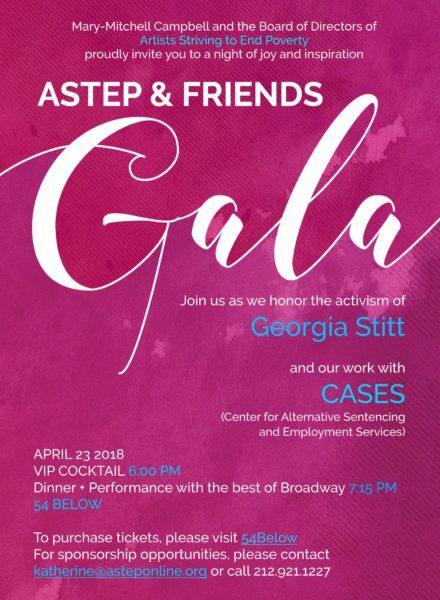 Come to the gala if your life and budget allow, and if not, please check out and support the work that they do, because it is truly life-changing. Arena Stage at the Mead Center for American Theater announces the full cast and creative team for the world-premiere musical Snow Child, based on Eowyn Ivey’s Pulitzer Prize-nominated novel. Infused with a score that combines Alaskan string band-traditions with contemporary musical theater, Snow Child follows a couple rebuilding their lives in the Alaskan wilderness when they meet a magical and mysterious snow child who transforms them. Concluding her 20th anniversary season at Arena Stage, Artistic Director Molly Smith directs this world-premiere musical, featuring a book by John Strand, music by Bob Banghart and Georgia Stitt and lyrics by Stitt. Snow Child is a co-production with Perseverance Theatre and runs April 13-May 20, 2018 in the Kreeger Theater, and May 25-27, 2018 in Anchorage, and June 9-10, 2018 in Juneau. The cast includes Matt Bogart as Jack, Christiane Noll as Mabel, Fina Strazza as the snow child Faina and Natalie Toro as Esther. D.C.-based actors Alex Alferov and Dan Manning will play Garrett and George, respectively. Rounding out the company are ensemble members Dorothy James, and D.C.-based David Landstrom and Calvin McCullough. I’m super excited to share with you the news that I was elected to the 2018 Dramatists Guild Council alongside some super ferocious hero-writers of mine. You all know how loud I can be. I’m gonna be loud on behalf of you theater writers now. Thank you for this! See complete list of Council Members HERE.